UPDATE 2016 – This restaurant has closed but you can now enjoy Michael’s food at The Man Behind The Curtain in Leeds. Since The Blind Swine opened in York it has been making culinary waves by serving up some of the most daring cuisine in the city. 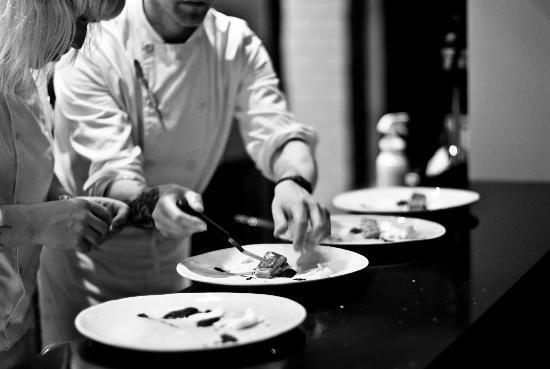 Head chef Michael O’Hare and his able team conjure up delightfully daring courses through their tasting menu experience and we have been hooked since visiting the restaurant in its early days. 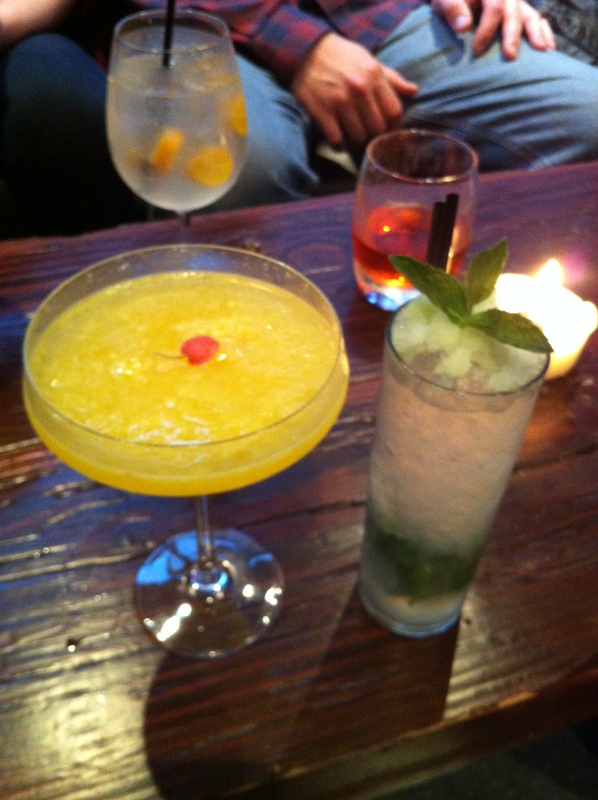 Last night, with a group of four friends, we set out to splurge on some of the finest cocktails and abstract flavour combinations York has to offer. Upon arrival we took the opportunity to sample offerings from the exotic cocktail menu and whilst the rather obtuse names didn’t offer many clues into what you were ordering, the ingredients list below did. These drinks change on a regular basis but I sampled a good few over the course of the night and its fair to say they were all delicious and plenty boozy! For us, the most exciting aspect of The Blind Swine experience is the adventure of the 15 course tasting menu so we opted to forego a viewing of the menu before we sat down and with Ozzy Osbourne as the soundtrack, prepared ourselves to meander through the molecular maze that would expend before us. Delicious! Cod Roe on Toast. 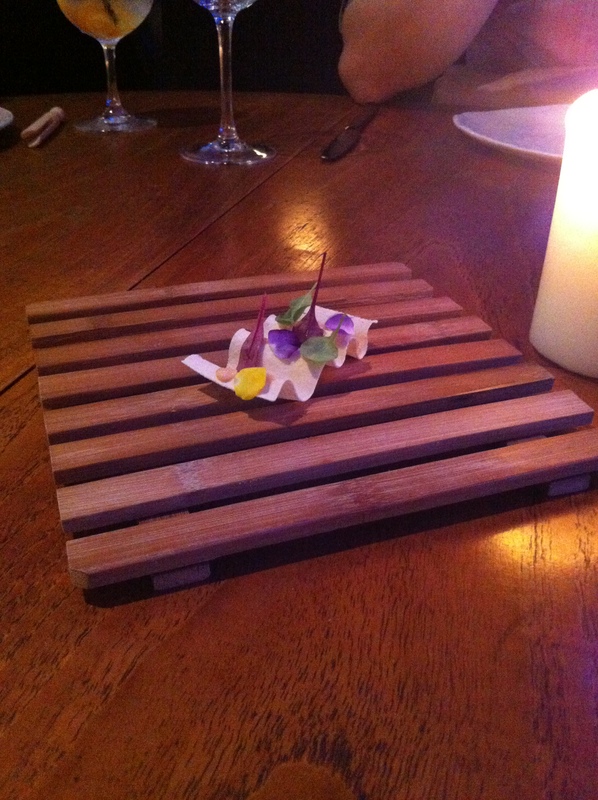 The first six courses of this menu were essentially a collection of palette-exciting, bite-sized starters which included, cod roe on a small cracker, roast potato on burnt yeast wrapped in Iberico fat, a beetroot, orange and vanilla soup and steak tartare with buttermilk and horseradish snow. 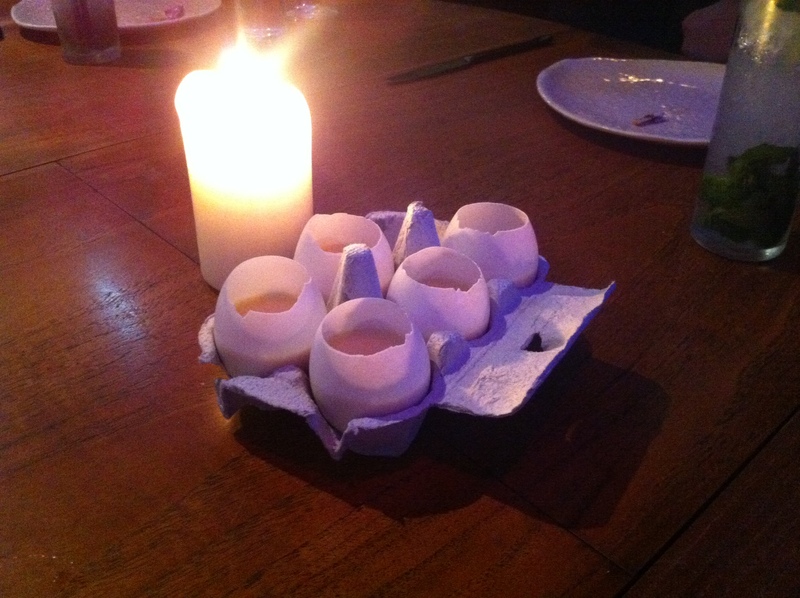 Two of the most visually delightful starters came in the form of the foie gras and hazelnut (which was served in the form of a feast ice lolly) and the duck yolk and rum shot which was presented in a cleaned out duck egg shell! Duck Yolk and Rum Shots! 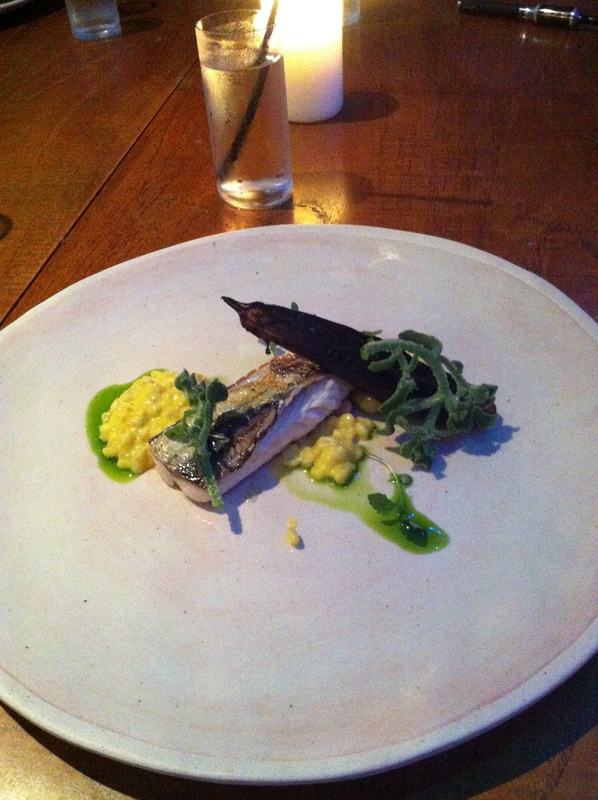 Stunning Mackerel, Aubergine and Pearl Barley fish course. This was followed by a plate of grouse with blackberry and baby leek which was again prepared with beautiful precision and paired with a blackberry beer which complimented it perfectly. 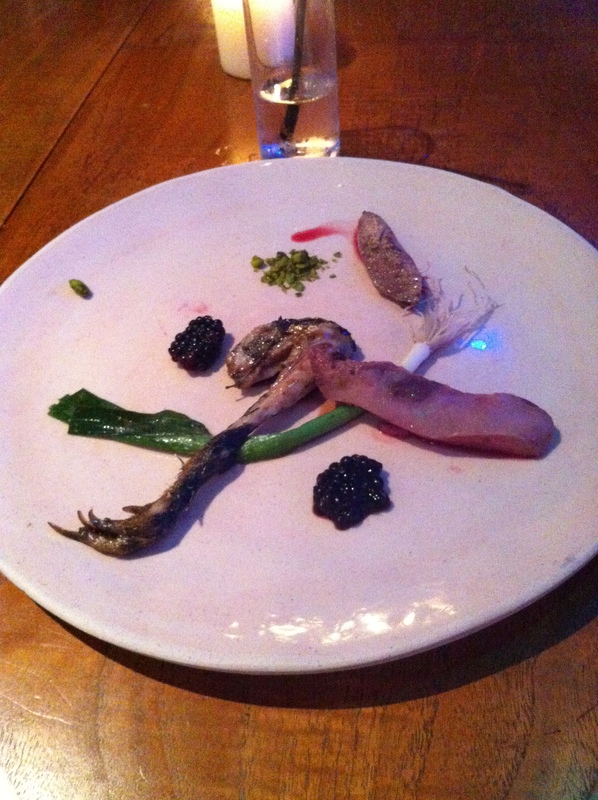 Grouse seved with Leek and Blackberry. Blackberry Beer just out of shot! After a second palette cleansing course of watermelon with mint and thyme, it was time to proceed into the dessert section of the meal which in previous visits has caused some controversy with members of our group and this time was no different! The opinion splitting article came in the form of a burnt white chocolate soil with a pine sauce and a cep frozen yoghurt. Personally I couldn’t get enough of the fungi-flavoured fro-yo (I did eat at least two portions) but I also noticed a few full plates returning to the kitchen. 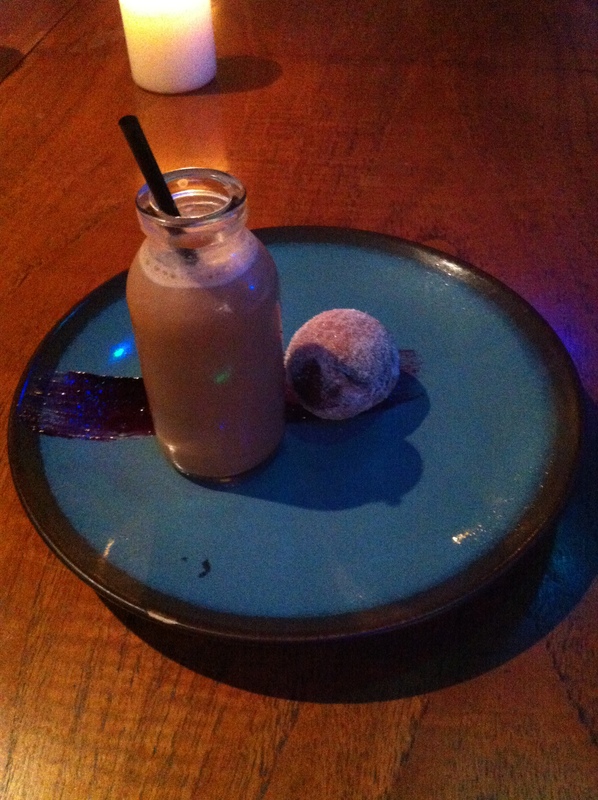 The desert course did however redeem itself with a cool de-constructed doughnut and iced coffee dish, which was gratefully received and polished off by all present! Iced Coffee and a Doughnut rounded things off nicely! The Blind Swine is probably my favourite restaurant in York. It opens your eyes to flavour combinations which you didn’t think were possible and also serves some of the best cocktails and beers you can get your lips around. The atmosphere is relaxed and whilst I have seen a lot of negative talk banded around regarding the heavy rock soundtrack, I think this takes the restaurant away from the stuffiness which often goes hand in hand with the creation of what you might term avant garde cuisine. The staff there are genuinely nice too, the chefs can be seen painstakingly assembling their beautifully presented creations and they still take the time to come out and explain each dish to you throughout the night. If you live in York I would urge you to get on board, wake up those taste buds and experience The Blind Swine as soon as you can (you’ll have to book well in advance for a weekend.) At £45 per head for 15 courses of food created with such an astute attention to detail, this is excellent value, as are the wine and cocktail pairings at £25 and £18 respectively. At the end of the day, whether you love every course or find that there are one or two which aren’t quite to your taste, you will be looking back and talking about the experience for a long time to come. You can also catch The Blind Swine team at York Food Festival where they will be taking part in exclusive cooking demonstrations on Sat 21st September and Saturday 29th September at 2pm. The event is free of charge and, after attending one of their demos before, I can say is definitely worth a watch. August 2014: The Blind Swine has now relocated to Leeds as ‘The Man Behind The Curtain’.